Let's now look at the first of the experiential learning tools. Materials are things that you use like 'realia' or paper cut-outs to use in games. They could be flash cards, color coded cards, pens, stationery items etc. For instance one could cut out geometrical shapes in red, green and amber. A set could be handed to each participant which they can use to indicate their opinion in a True/False/Not Sure activity. These activities serve very well as feedback to the trainer/facilitator. Another method of class management is the use of hand signals. A common one is the stop signal. It indicates stopping everything to look at the facilitator. Teaching this signal in advance makes it easy to implement. It replaces, raising your voice to make yourself heard, shushing etc. 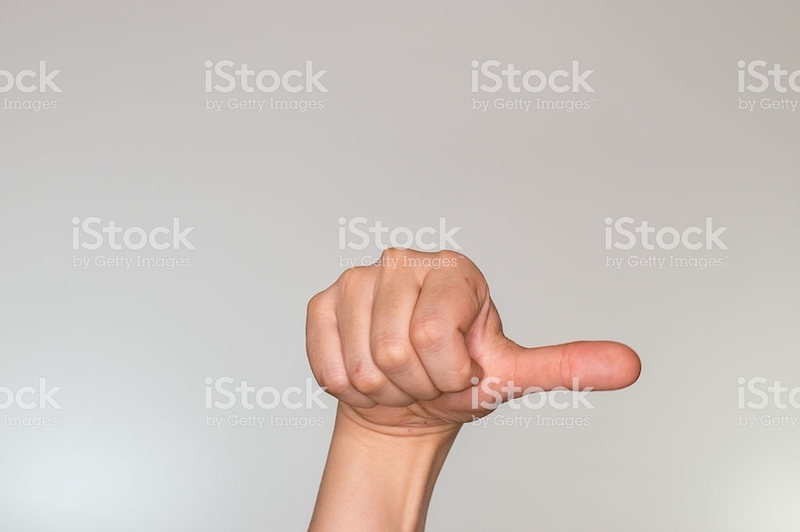 The 'Sideways Thumb' indicates 'I don't know' or 'I'm not sure'. This is a signal for the facilitator to check the point that is unclear to the participant. Another way to get students to show their agreement with what you are saying is the Binary hand signal. In the image on the right the are zero and one indicated by hand signals. Evidently, 'true' is indicated by showing the index finger or the symbol for 1, whereas 'false' is indicated by showing the zero hand signal. Experiential Learning Tool 3: 'Role-plays'. Role-plays are small two-three minute plays that the trainer uses to either highlight the current situation or to practice a skill that has been learned. Generally they involve a few lines describing a situation. This description is given to participants for them to read, understand and represent it as a small drama. Role plays can be used to process learning at different levels of complexity. They can be used to help participant to identify a concept, or use a certain skill learned during the training. Sometimes it is used to help participants discover themselves. The last kind require some intense work with the participants in terms of debrief. Experiential Learning Tool 4: 'Inventories'. Inventories are standardised tools that are mainly used by trainers to provide opportunities for self discovery and reflection. The pariticipants can use these opportunities to assess their attitudes, skills and knowledge in areas relevant to the training. Inventories help the participants focus their learning efforts towards bridging the gaps revealed by inventories. The factors in the inventory also becomes a checklist to check against as they progress on the learning curve. Thers are inentories for learning styles, listening, leadership styles, supervisory attitudes, emotional awareness etc to name a few. Experiential Learning Tool 5: 'Handouts'. Handouts are reading material provided to participants during the course of the training. The handouts serve the purpose of provoking the participants to think differently. What better way to do this than through excerpts from experts. Handouts also serve as reminders after trainings are over. They outline major concepts and their main details. Handouts provide trainers the flexibility of providing reading during training as well as make this a short exercise of a couple of minutes. They are a pleasant change from just listening to lectures. Experiential Learning Tool 6: 'Stories'. Stories are a great way of providing short vicarious instances of somebody else's experience. They are priceless when it comes to communicating concepts in a few words. At the same time they allow the trainer to bring home the most important learning point. Stories are a great way of keeping participants enthralled with the spoken word and at the same time using it as a learning opportunity. Stories like games are never forgotten and make learning a permanent feature. This is especially true when the trainer is faced with a shortage of time and he cannot use other experiential learning tools that are mentioned above. For other categories of training games go to the Training games page and follow the links.